Nothing says 4th of July better than... hot dogs!!! Ok, whatever (you're no fun). Last month I drew this mascot as kind of a commissioned work for a local hot dog stand (or more like someone's get-rich scheme) that didn't get off the ground. I guess they never used it, since I never got paid. Hence, it never got past the pencils & ink phase. Still, it was fun to draw because it was really fast, really simple, and I didn't have to worry about detail. So, what did I learn from this experience? 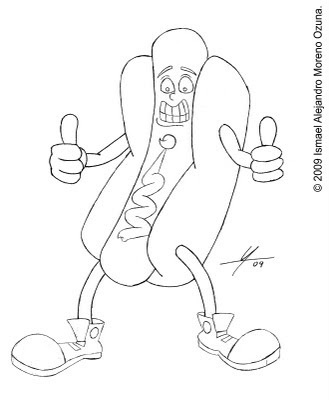 It's really hard to draw a cartoon hot dog that doesn't look like the Wienerschnitzel mascot. Making it wear Converse tennis shoes doesn't help either. El mes pasado dibujé esta mascota que fue más o menos un trabajo por encargo para un puesto de hotdogs local que no se pudo levantar. Supongo que nunca lo utilizaron, ya que nunca me pagaron. Por lo tanto, nunca pasó de la fase de lápiz & tinta. Sin embargo, fue divertido dibujarlo porque fue muy rápido, muy simple, y no tuve que preocuparme por el detalle. ¿Entonces, qué aprendí de esta experiencia? Que es muy difícil dibujar un hotdog de caricatura que no se parezca la mascota de Wienerschnitzel. Ponerle tenis Converse tampoco ayuda. The Sausage Bandit Strikes Again!